Hotels usually offer large carts which makes the loading easier. "Not as many trips to and from the car," said Beth Anne Martin. Every inch of Mary Ortwine's car is filled with her props and creations. 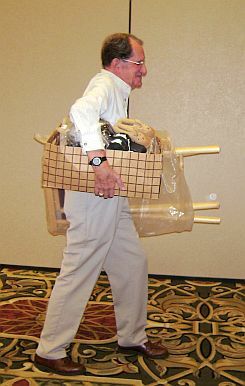 "We keep in shape walking to and from the car while carrying merchandise," says Norman Roberts. "Often we are awake at 5 a.m. to start our day." The showroom is beginning to take shape and soon all the bears will be in place; ready for the show's opening. 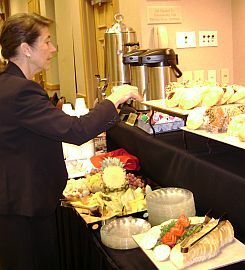 "We enjoy the promoter's morning treats," Says Brenda Yenke, "as often we do not have time for breakfast." Artist enjoy coffee and catching up since the last time they met. "The bear artists are my extended family," says Dale Junker. Show's over and it is time to pack the props and unsold merchandise into the car for the trip back home. 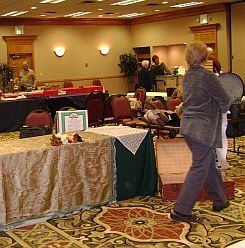 "I always like the extra space that good show sales offer me," says Beth Ann Martin. 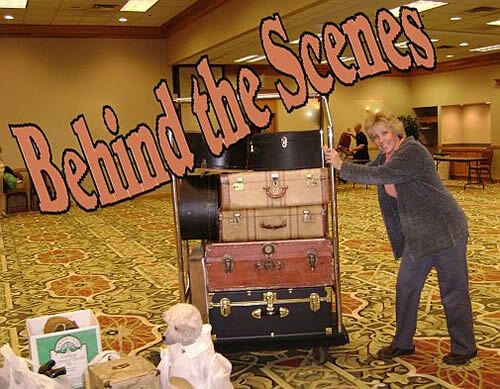 When collectors attend a bear show and they see all the bear artists with their wonderful creations displayed in a myriad of different ways, all clean, pressed and ready to go, do you ever wonder what it takes to get them there? Doing a teddy bear show, as much fun as it is, takes a lot of hard work, planning and effort on the part of the artists and promoters. The first step is to decide what show or shows, we want to do. This depends on several things including where we live, how far we want to travel, whether to fly or drive and cost, which includes show fee, hotel, etc. 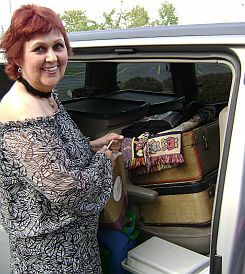 I prefer to participate in shows that I can drive to because I can take more 'stuff'! To pick a show, we generally look in teddy bear magazines, research the internet or ask other artists. Once we have decided on a show, we need to apply to see if there are any spaces available and possibly send some pictures of our work to be juried; that all depends on the show promoter's policies. We then need to organize hotel rooms, travel arrangements, care of our family and pets. Each state requires us to collect sales tax. In some states, we must apply for a full license; some use a one time event license. Most sales taxes differ from state to state so we need to make sure we know the sales tax of the state the show is in. Usually we have about 15 days after the show to send in the one time event sales tax. The full sales tax licenses have differing filing durations, ranging from 3-12 months. Yes, even teddy bear artists have to do paperwork! Once we have entered the show, we start getting our stock ready. How many bears should we take? This depends on the artist. I like to take as many as I can make before the show! There is always room for one more bear. This is not only true for the collectors but for artists too! Another factor in determining how many bears to take is how much time we have and how we want to display them. You don't want too many bears squeezed onto your table. It would be difficult for the collectors to see them all and it depends on the size of bears too. I like to take a range of sizes. Pricing our bears is not always easy. It is difficult to put a price on handwork. When mohair ranges from $70.00- $240.00+ per yard, we have to take into account the materials and the time it takes to make the bear. A good guide is to look at teddy magazines and web sites to get a feel for the market. Pricing is one of the hardest things an artist has to do. Our time is factored into each piece too. Once our stock is made and we have decided on a price, we label and price the bears clearly. As the date of the show approaches, the real fun starts! Packing. If we are flying to a show we are limited to the amount of luggage and the weight of each case that the airline will allow. This itself can pose quite a challenge. If you have smaller bears, it's a little easier but if your bears are a little bigger, getting all the bears in can take some creative thinking. 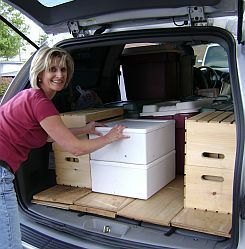 Many artists ship their bears to the hotel and this does create more risks. In addition to having to pack bears, you need to have some sort of display materials! Boxes are a wonderful help. They can be cut down, folded and packed into suitcases easily. Don't forget to leave room for clothes and toiletries. That's why I like to drive; I can get quite a bit of stuff in my vehicle. It's always nice to have a friend or family member to accompany you and if you're flying, you can take more cases and if you're driving, they provided company and are a great extra pair of hands. On the morning of the show, we have to bring all our boxes, cases, and display props into the show room, which usually open between 6-7a.m. We are often unloading in the dark. Sometimes we can set up our displays the night before which can be really nice. 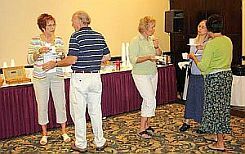 It depends if the hotel has a function or it can even depend on their security. It usually takes me anywhere from 2-3 hours to get my display the way I want it. During set up, we often have time to meet new artists, catch up with others, and share news and happenings in our bear world. As opening time approaches, there is a general air of expectant excitement. After all, with this kind of work, we often ask ourselves, 'will anybody like and buy my bears?' Even after 16 years of attending shows, I still get little butterflies in my stomach! Doing a show is great; seeing collectors you haven't seen for a while and meeting new ones. The best thing for me is to see the connection between a collector and a bear. It's priceless! It's nice to walk around the showroom and see all the new creations from our fellow artists. However, this can be a little dangerous too since we are not immune to the wily ways of these bears; to grab you by the heart strings and reel you in. We all want to add more bears to our collection. Lunch is often eaten on the run. Hot food gets cold, but we are used to it as our collectors are important to us. As the show grows to a close and the last bears are being adopted, it's time to start packing up. I'm never too sure if this is better than setting up or not. The focus is getting the unsold bears and displays packed and getting the return journey underway. It usually takes me between ½ hr-1hr to pack and load my vehicle. On the way, my focus is on returning home safely and it gives me time to think about the next show, which bears I'm going to make, and if all my travel arrangements made. All I can say is that it takes a lot of work and effort but I wouldn't want it any other way. A few minutes before the show opens, artists have time to socialize and see what's new!